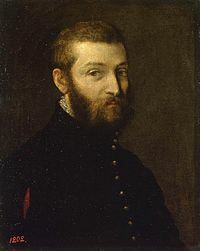 Paolo Veronese (1528 – 19 April 1588) was an Italian painter of the Renaissance. He was a Venetian. He is remembered for paintings such as The Wedding at Cana and The Feast in the House of Levi. He became known as "Veronese" from his birthplace in Verona. His best works are elaborate narratives. These are executed in a dramatic and colorful Mannerist style. They are full of majestic architectural settings and pageantry. His large paintings of biblical feasts are especially notable. This page was last changed on 17 March 2017, at 13:22.